The new concert hall would sit atop Callaway Plaza, now used for drop-offs and parking at the southern edge of the 41-year-old arts center. The plan requires demolishing some of the center, which houses the current Symphony Hall, the Alliance Theatre and other facilities. This is the replacement site for the 14th street site, which never generated much excitement among donors (or, ahem, bloggers). Architect Santiago Calatrava is still on-board, apparently, which is good news. While the site didn't get much attention, his design did. 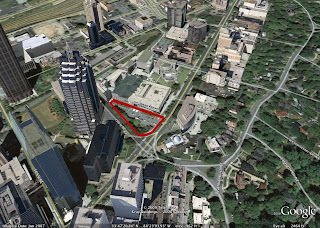 Buy property on Peachtree Street, and hold on to it. This site, of course, kind of combines both sayings. I also like the new site since it addresses what I think was always a major shortcoming of the original center's design, which is the fairly useless plaza at the very visible intersection. I just felt it was way too suburban for such an urban site, although I recognize that Midtown was significantly less dense when this was built 41 years ago. Be afraid! Don't go out at night! Boo!